WASHINGTON (CNS) — The U.S. Supreme Court heard oral arguments in its first abortion case in nine years March 2 in a challenge by Texas abortion clinics to a 2013 state law that requires them to comply with standards of ambulatory surgical centers and their doctors to have admitting privileges at local hospitals. The almost 90 minutes of oral arguments March 2 were before a court left with eight members following the Feb. 13 death of Justice Antonin Scalia, who regularly voted to uphold abortion limitations and was expected to have provided the fifth vote in this case to uphold the requirements. If the justices vote 4-4 in a decision on this case, they will uphold a lower court’s decision approving the Texas law, but the case would not set a national precedent. Stephanie Toti, a lawyer for the Center for Reproductive Rights in New York City, presented the oral arguments on behalf of the clinics and doctors, and U.S. Solicitor General Donald Verrilli Jr. was given 10 minutes to argue for the federal government’s support of the clinics. Scott Keller, solicitor general of Texas, delivered the arguments defending the state law on abortion clinic restrictions. In 2007, the Supreme Court in a 5-4 decision upheld the federal ban on partial-birth abortion, signed into law in 2003 by President George W. Bush. 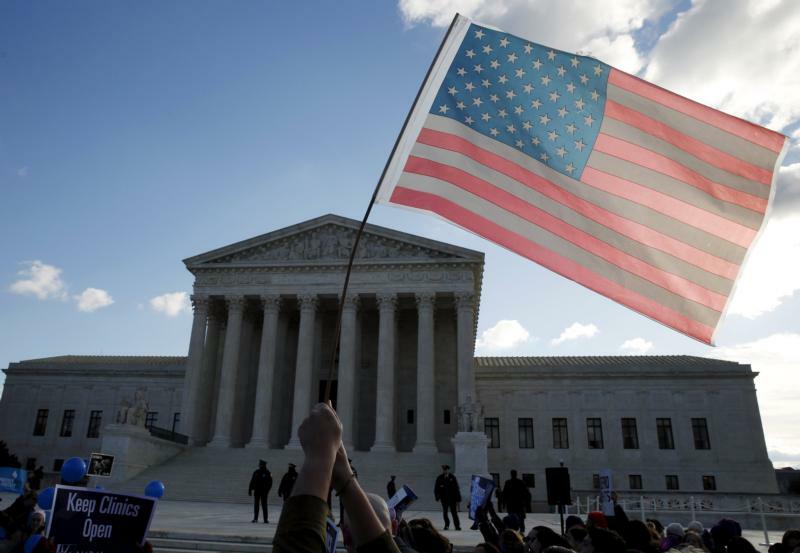 The law had withstood several court challenges on constitutional grounds before it was upheld. During the March 2 arguments, justices chided each side for failing to produce better evidence to support their arguments. Some justices challenged the plaintiffs’ claims that the law would put abortion out of reach and also wondered if the state law was the reason so many clinics had closed, and others questioned the state’s motivation for imposing such requirements on abortion clinics and their doctors. Justice Anthony Kennedy, clearly looked upon as the deciding vote in this case, asked Toti if it would be appropriate for the court to remand the case for more fact-finding, particularly about the capacity of the state’s remaining abortion clinics. Some clinics closed after the Texas law went into effect. He also asked if the state law may have persuaded women to seek surgical abortions rather than ones induced by drugs. The solicitor general argued there is evidence showing that the remaining clinics in Texas are not ready to handle large numbers of extra patients they would have to take on because of the closures of clinics that didn’t meet state requirements. The remaining abortion clinics would need to increase to four or five times their current size to meet the demand and “common sense” says that they won’t be able to do so, Verrilli said. Keller, arguing in defense of the Texas law, said it strikes a proper balance and that major metropolitan areas in the state that currently have clinics would continue to have them. He also noted that more than 90 percent of Texas women live within 150 miles of an abortion clinic. Justice Elena Kagan said the law could affect hundreds of thousands of women who would have to travel much farther to reach a clinic and said the increased distances to a clinic is far greater now than before. Keller said the state was motivated by the case of Kermit Gosnell, a Philadelphia abortion doctor who in 2013 was convicted of multiple crimes including murder of infants born alive. Justice Ruth Bader Ginsburg did not buy that argument because she said Gosnell was a lawbreaker whose clinic had not been inspected for more than 15 years, but Texas has aggressively inspected clinics and has found nothing like the Gosnell case. Opponents of the Texas law have said its requirements for clinics and doctors are simply aimed at closing abortion clinics and have created an “undue burden” on women who want an abortion; the state has maintained the law is protecting women’s health. The U.S. Conference of Catholic Bishops and other religious groups submitted a joint friend of the court brief in the case supporting the Texas law. The brief said the Supreme Court has held since Roe v. Wade, the landmark 1973 case legalizing abortion in the U.S., that states may enforce standards regarding the qualifications of doctors who perform abortions and the conditions of facilities in which abortions are carried out. “To hold that states may not enact measures like the Texas law challenged here would be a betrayal of over 40 years of precedent,” the brief said. Legal analyst Lyle Denniston, writing for the www.scotusblog.com, a blog on the Supreme Court, said the Texas case “provides almost a textbook example of challenging abortion by new regulations of clinic procedures.” He pointed out that before the Texas Legislature adopted two new restrictions three years ago, there were 41 clinics in Texas performing abortions, but after the law was passed — and before it was blocked by the high court — that number dropped to 19, and is likely to drop to 10 clinics in the state if the court upholds the law. In this case, the court is dealing with a Texas law, similar to other laws in states across the country that restrict abortion clinics, an approach that some argue could have a better chance of success with the court than challenges to abortion procedures. Denniston also noted there is a possibility the justices will send this case back to the lower courts, which could be determined by preliminary vote when they meet for a private conference as early as March 4. If the case proceeds as expected, a decision should be announced in late June. The March 2 case, Whole Woman’s Health v. Hellerstedt, had been filed previously as Whole Woman’s Health v. Cole, but the name was changed because John Hellerstedt was appointed commissioner of the Texas Department of State Health Services Jan. 1.